Haglund’s deformity is a bony deformity or prominence dorsally and laterally on the back of the heel which commonly leads to dull, aching soreness at the area known as bursitis. Painful bursitis is the inflammation of a fluid-filled sac between the tendon and bone, and between the tendon and the skin. Haglund’s deformity is also known as “pump bump” because the condition is common in women who wear high heels (or pumps). The pressure from a high-heeled shoe aggravates the enlargement when walking. Patrick Haglund was the first to describe the deformity associated with pain to the back of the heel in 1928. Haglund’s Deformity: a ridge of bone along the posterior superior lateral ridge of the calcaneus often causing bursal inflammation of the Achilles bursa and often associated with calcification or spur of the posterior portion of the calcaneus. This may take form at the Achilles insertion and commonly involves calcification within the tendon itself. Biomechanics: To some extent, heredity plays a role in Haglund’s deformity. People can inherit a type of foot structure that makes them prone to developing this condition. 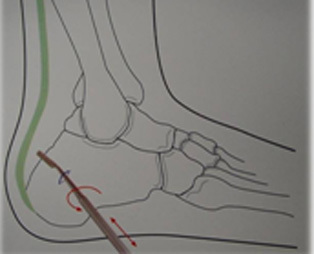 The contributing factors include a supinated foot type with a tendency to walk on the outside of the heel, a heel bone with a prominence (a pointed shape that sticks out toward the tendon) at the back, a tight Achilles tendon and a high arch. All of these factors simply make it more likely that the back of the heel will press against the shoe and rub. As the tendon gets rubbed the wrong way, the bursa starts to develop and fill with fluid. Footwear: Certain types of footwear such as shoes with a rigid back, ice skates, dress shoes, or women’s pumps, can cause irritation and contribute to the development of Haglund’s Deformity. That is why this condition is more common in women than men. Footwear can exacerbate the problem caused by the original genetic structure. Redness and swelling near the inflamed tissue at the back of the heel. Pain or tenderness at the lateral posterosuperior aspect of the heel, usually aggravated by shoe gear pressure. The back of the heel hurts worse when you run or wear high heels. Bump slowly growing on the back of the heel. Physical exam: Clinical observation of the Haglund’s deformity is typical to make the diagnosis. Your doctor will ask you questions about the symptoms you are experiencing. The structure and biomechanics of the patient’s entire foot is examined. 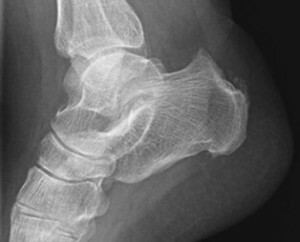 X-rays: X-rays will usually be required to allow the surgeon to see how the calcaneus (Heel bone) is shaped, joint alignment in the rear foot, and to look for calcification in the Achilles tendon. X- rays also are helpful in ruling out other causes for your heel pain. The first method of conservatively treating Haglund’s Deformity begins with accommodating the deformity. The goal is to reduce friction and relieve pressure on the painful area. Medication: Anti-inflammatory medications may help reduce the pain and inflammation. Oral non-steroidal anti-inflammatory drugs (NSAIDs), such as ibuprofen, may be recommended to reduce the pain and inflammation. Ice: To reduce swelling, it may be helpful to apply a bag of ice over a thin towel to the affected area for 15 minutes as needed. Do not put ice directly against the skin. Exercises: Stretching exercises help relieve tension from the Achilles tendon. These exercises are especially important for the patient who has a short, tight heel tendon. Avoid running on hard surfaces and running uphill when possible. Heel lifts: Patients with high arches may find that heel lifts placed inside the shoe decrease the pressure on the heel. Heel pads: Placing pads inside the shoe cushions the heel and may help reduce irritation when walking. Shoe selection: Wearing shoes that are backless or have soft backs will avoid or minimize irritation. Physical therapy: Inflammation is sometimes reduced with certain forms of physical therapy, such as ultrasound therapy. Orthotic devices: Custom made orthotic devices are helpful because they control the abnormal motion in the foot, which can aggravate symptoms. In some cases, casting may be necessary to reduce symptoms. Conservative treatments for Haglund’s Deformity are sometimes limited because they cannot correct the bone deformity involved. If conservative treatment fails or the deformity progresses to the point where conservative treatment is no longer a viable option, surgical intervention may be needed for correction. 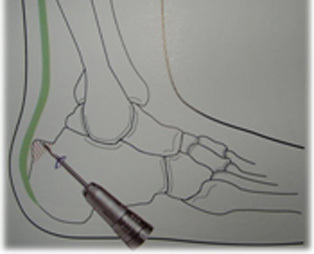 Both the traditional and minimally invasive Haglund’s Deformity surgical correction techniques are performed at the Coeur d’Alene Foot and Ankle Surgery Center. Both techniques involve performing a resection of the posterior/lateral bump of the heel. 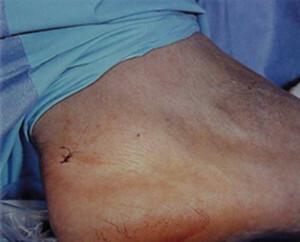 Most cases of Haglund’s deformity can be corrected without displacement of the Achilles tendon from the back of the heel. This procedure is typically performed in the prone position. 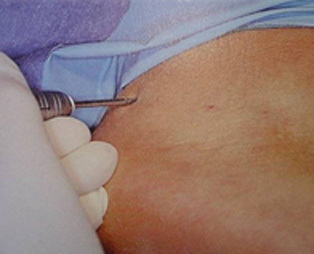 Due to the fact that the minimally invasive techniques are less traumatic, and the recovery time shorter, most patients prefer this method of correction. Each patient is unique, and the doctor will discuss which technique he feels best suits the patient for optimal outcome. 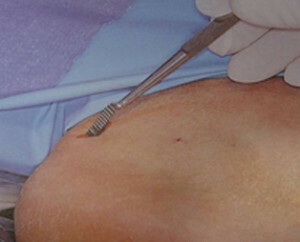 Open or traditional surgical correction techniques involve larger incisions to perform the removal of the bump. 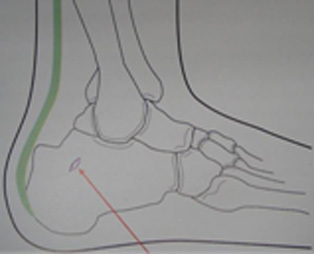 The surgeon may take out a wedge of bone from the calcaneus, shortening it. Surgeons refer to this as a wedge osteotomy. 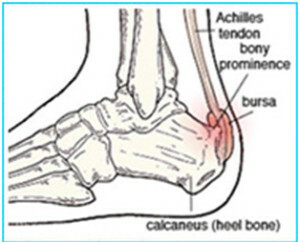 In other techniques the bump is simply removed, and the calcaneus is shaped and rounded so that the pressure does not occur. The incision is closed with stitches, and you are placed in a bandage to protect the foot while it heals. You may be placed in a splint for certain open technique corrections. Dr. Nunez does a minimally invasive ambulatory surgical technique to correct Haglund’s Deformity. It involves making a small incision approximately 1cm on the posterior lateral aspect of the heel to remove the bony exostosis or bump. The small surgical incision enables the surgeon to use fine specially designed instruments to obtain the best cosmetic result. Surgery is performed under Fluoroscopic viewing. There is generally less trauma to the tissue and surgical times are lessened with this technique, reducing pain and recovery time. Less suturing is necessary and often times no sutures are used. Postoperative patients ambulate immediately and are often placed in a surgical shoe or boot to aid ambulation. Surgeries are performed at the CDA Foot and Ankle Surgery Center and are done with just local foot block injections wherein the foot usually stays asleep 4 to 6 hours. A small surgical incision is used which enables the surgeon to use fine specially designed instruments for the best cosmetic result. Often times no sutures are required due to the small incision size. Dr. Nunez also uses a fluoroscope during surgery, enabling him to visualize foot anatomy during surgery in spite of the small incisions. The entire surgery takes approximately 2 hours. This includes viewing a preoperative video and procedure explanation, anesthetic administration, setting up the sterile field, the surgical procedure and postoperative dressing and instructions. The dressing must stay dry, clean and intact and is not changed until the first postoperative office visit. The patient leaves the facility walking with a special surgical boot or shoe only. It will be provided for the patient. Crutches or walkers are usually NOT needed.